The Chinese political interference follows the Russian hack-and-release intelligence operation to influence the outcome of the 2016 presidential election. 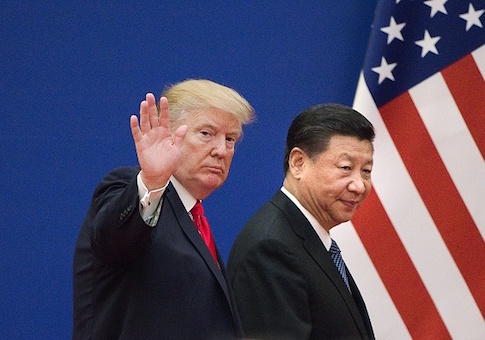 The Trump administration this month imposed $200 billion in tariffs on Chinese goods in a bid to counter Chinese technology theft and unfair trade practices. China retaliated by imposing $60 billion in tariffs on U.S. goods. Trump was asked later during a press conference about evidence of Chinese election meddling and said cryptically: "We have evidence, we have evidence—it'll come out." China has "actually admitted that they're going after farmers," he said. The president who frequently has said Chinese president Xi Jinping is a friend appeared to change that view. "I like China and I like President Xi a lot. I think he's a friend of mine, he may not be a friend of mine anymore," Trump said. Asked how he could call Xi a friend while China is meddling in U.S. elections, Trump said: "Maybe he's not anymore." Trump said the Chinese are "trying to convince people to go against Donald Trump" because he has challenged China's trade policies that he said have resulted in Beijing taking $500 billion a year from the United States to "rebuild their country." Trump mentioned one example of the Chinese operation was a four-page newspaper supplement purchased by the Chinese propaganda outlet China Daily. The insert was circulated in the Sunday Des Moines Register. The advertising supplement sought to undermine farm-country backing for Trump's trade policies. Iowa farms could lose up to $2.2 billion from the trade war with China. Compared with Russian influence operations, the Chinese operations are different and oriented to propaganda like the newspaper insert and generating negative cable television coverage highlighting how farmers are being hurt, Trump said. A senior administration official who briefed reporters on the interference by China said Beijing is using a large-scale program of "united front" Communist Party activities involving political, economic, commercial, military, and informational tools. "The activities have reached an unacceptable level," the official said. The official said China is "actively interfering in our political system" by hurting farmers and engaging in activities in states and districts that voted for the president "because he stood up to the ways that China has taken advantage of our country economically." China's government also has been influencing American businessmen, think tanks, movie studios, journalists, religious leaders, and political candidates based on whether "they criticize or support China's policies." "China spends billions of dollars on propaganda here and throughout the world," the official said. Chinese influence operations include the use of cyber bullying, threatening phone calls from Chinese embassy officials, and working to stifle free speech at U.S. universities by targeting administrators, professors, and Chinese students, the official said. The united front operations involve the use of cyber attacks, propaganda, and in some cases corruption. China also leverages the issuing of visas to travel to China as an influence tool. Embassies and consulates deny visas for travel to China for anyone who criticizes the Communist Party and its dictatorial system or is deemed to be "anti-China." China also has forced American entertainment companies to censor or alter content. "It certainly spreads to things like market access for American entertainment," the official said. "That means Hollywood has had to kowtow, in effect, to Chinese censors when it makes movies for the world market." For example, the movie studio MGM in 2010 was forced to change a key element in the remake of the film Red Dawn under pressure from China. Initially, the film showed Chinese military forces conducting an invasion of the United States. But the studio changed the invading troops to North Koreans before releasing the film to appease Beijing. The administration official said Chinese election interference goes beyond targeting voters in farm states hit by tariffs. More information on the influence operations will be disclosed in the coming weeks. In addition to influence operations, China has also sought to purchase U.S. entertainment companies and movie theaters as a way to control what Americans see and hear about China. On campuses, China has funded Confucius Institutes that the FBI has said have been used for Chinese intelligence influence and other activities. The president's discussion of Chinese influence operations also comes amid growing tensions between the U.S. and Chinese militaries. The State Department sanctioned a senior PLA general last week prompting the Chinese military to cut off talks and cancel a scheduled port visit by a U.S. warship to Hong Kong. Asked about a U.S. bomber flight over the contested South China Sea this week, Defense Secretary Jim Mattis told reporters on Wednesday the flights were routine. "If it was 20 years ago and [China] had not militarized those features there, it would've just been another bomber on its way to Diego Garcia or whatever," Mattis said. "So there's nothing out of the ordinary about it, nor about our ship sailing through there," he said. "I've noticed that other nations have also incurred certain diplomatic wrath out of Beijing for sailing their ships through. It's international waters, folks. It's international waters." Asked about the denial of a port visit for the USS Wasp to stop in Hong Kong, Mattis said: "I'm not sure what to make of it right now. We're sorting out." "I don't think that we're seeing a fundamental shift in anything," he said. "We're just going through one of those periodic points where we've got to learn to manage our differences." This entry was posted in National Security and tagged 2018 Election, China. Bookmark the permalink.